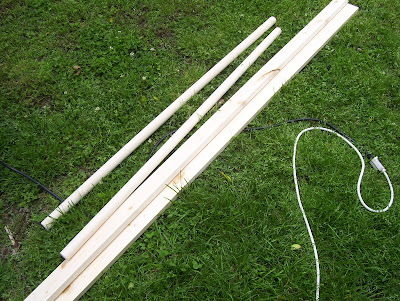 Two 1 1/4 inch dowels and two 1 x 3's 6 feet in length from your local building center. With a miter saw, cut each dowel into 3 pieces giving you 6 equal pieces. They should each be 16 inches long. You will only need 5 of these. 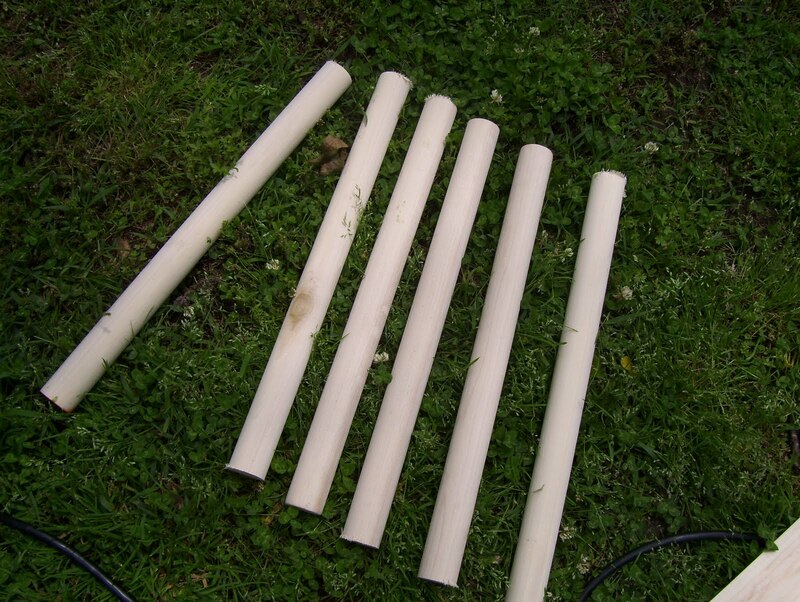 Measure how far from the end you would like your dowel to be and mark it. Mine was approximately 8 inches. Place your dowel on your mark, making sure it's centered on the wood and trace it with a pencil. 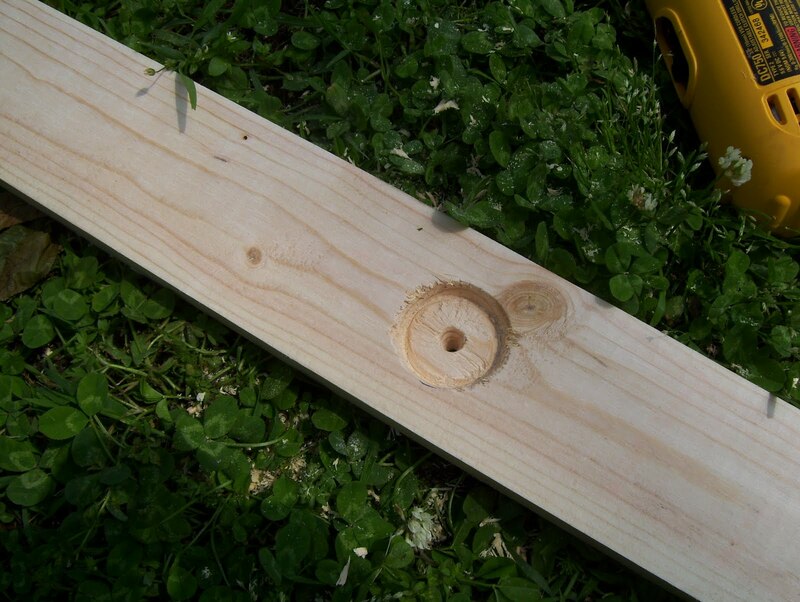 This is where you will drill your hole. 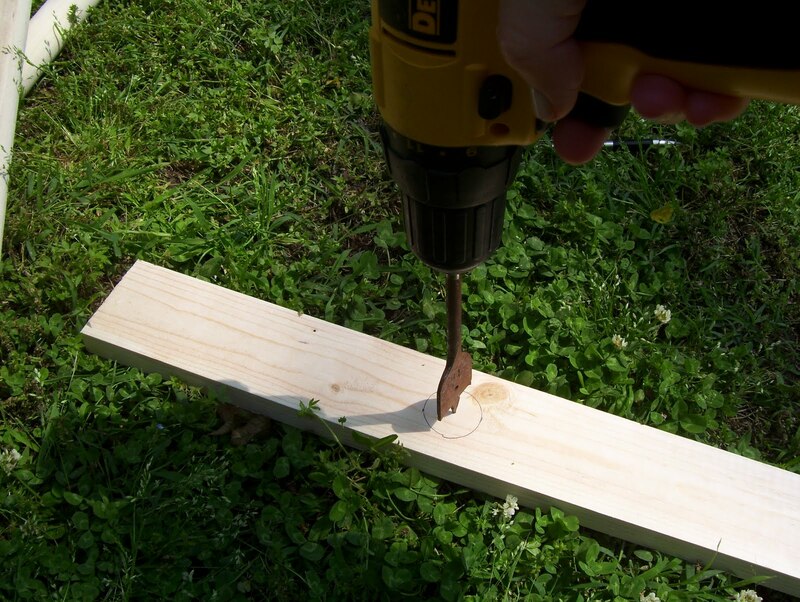 Using a drill with a 1 1/4 inch saw drill bit, drill your hole, making sure to not go through the wood on the other side, like I did. No worries if you do, wood filler will fix it up. This is what it will look like. Now, obviously this ladder is NOT going to be used as a ladder. But to make sure it was stable and didn't come apart, we drilled 1 1/2 inch screws through the outside of the board where each dowel was inserted. Sink the screws into the wood and then fill the holes with wood putty. After your wood putty dries, go over it with fine sandpaper to give it a smooth finish. Looks like a ladder, right?! To give it a "vintage" look, I first took my palm sander and sanded down the edges and ends to soften them up and create a rounded, worn down look. Then grab a can of Minwax special walnut stain and slather on a thick layer of it, let it absorb for 15 minutes or so and then wipe off excess with an old rag. You're done for the day as this needs to dry overnight. Go relax with a glass of cold lemonade in a pretty glass and a good movie with someone you love. After 24 hours, grab some white paint and paint one coat over the stain. Again, this needs to dry for several hours. 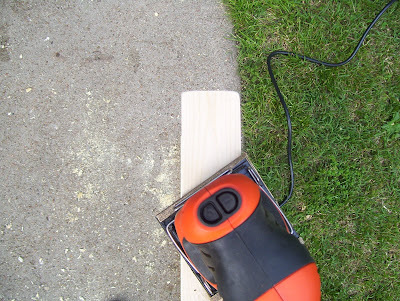 After the paint has dried thoroughly, take your palm sander, or a piece of medium to fine grit sandpaper and start sanding off the white paint in areas where there would be normal wear. 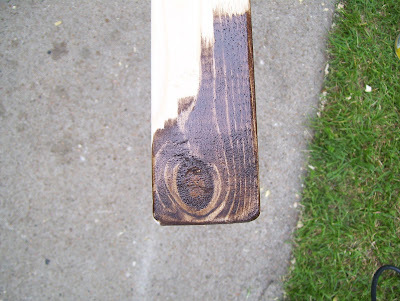 You want to sand down to the stain so you will be removing a lot of the white paint in some areas. 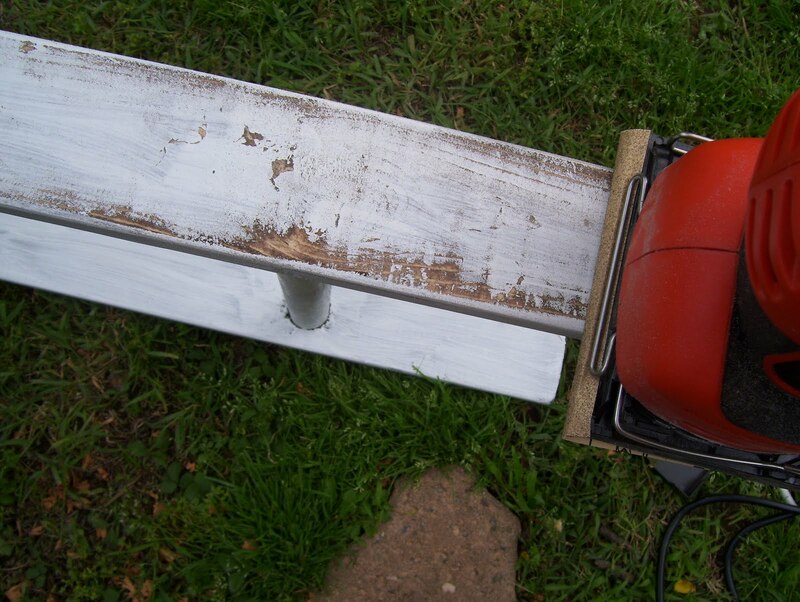 When it looks good and distressed, take a piece of extra fine sandpaper or steel wool and smooth out the surface. Remove dust with a tack cloth and your done! A vintage ladder for less than $10 instead of the $30+ I've seen them sell for. It doesn't bother me that it isn't really vintage, it was the "look" I was after. These ladders are so charming and are perfect for holding fluffy white towels, favorite magazines or anything else that makes you happy. I made this for our master bath which is the next room currently getting a redo. Pics of that coming this week. I've got a couple of other fun projects lined out for that room so stay tuned. 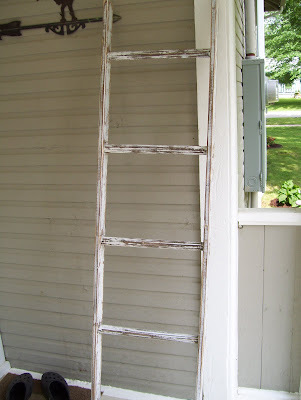 I hope this tutorial was helpful if anyone would like to make a faux vintage ladder! Have a happy day! Linking up with The Lettered Cottage and Stay At Home Nation this week! wow, I am so trying this! This is beautiful...I have been trying to find one of my own, now you have inspired me to make one! OMG! Love it, looks pretty simple and fun to make, glad you shared :) I'm so glad to be back reading through blogs and linky parties! I'll have to keep cruising through some of the posts I missed last week! You make it look so easy and the result is gorgeous. Girl, I've been hunting for one for months, with the same results. NO ladders! I wonder if I could make on that looks as good as yours!? Thanks for the inspiration. awesome tutorial - found you thru pinterest. This is so cute! Not good for a house full of children but still oh so cute! Stopping by from the Lettered Cottage DIY party. I would love for you to come link up to my party too, going on all week! Looks great. 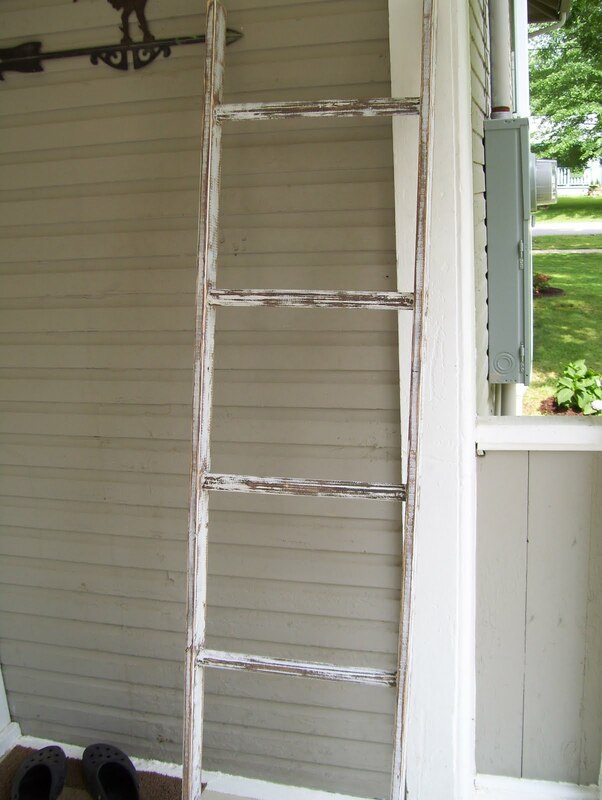 I actually have an old ladder from my grandparents that I need to paint and distress. Love that you made your own. Pinning this! I want one! Yay! I so want to try this after fruitlessly hunting for one! Thank you! I followed your instructions and it turned out great! That's great! Send me a pic! Would love to see it! Thank you for the great tutorial. Now if I can just get my hubby to make it for me. My birthday is this month so there is a possibility! I have fallen in love with your blog! 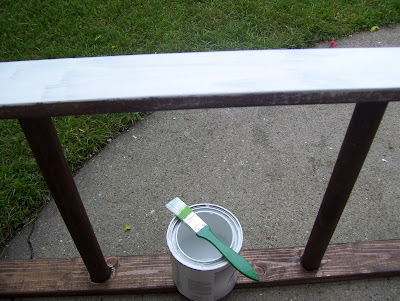 I was wondering if you have ever used milk paint on any of your projects? Someone suggested it to me and I've fallen completely in love with it! Gives everything a really cool "older" look. I've used it on some of my furniture refinishes and get tons of compliments! love it, doing it for my master "spa" bath project! Thanks for this easy DIY project! Completed it and couldn't be happier! Love, love, love your ladder!! It looks perfectly old and weathered. I've had this exact same idea in my head but wasn't sure how to execute it as I've never touched distressing furniture or anything. Will be following your tutorial when it's time to make it! Mine will be to display some dishcloths my grand-ma handembroidered when she was 16 that she gave me a couple of Christmases ago and which are just sitting on a shelf in my linen closet. So, so excited to get this done and to display them now that I've got a clear cut plan on how to make the ladder! Thank you ever so much! Awesome! Here, ladders are pretty expensive also and your DIY ladder is the best I've seen so far. The distressed look is gorgeous! I immediately showed my hubbie your photos and asked if he had such a drill too etc. Yippee, it seems we have everything we need for this, even the dark stain. 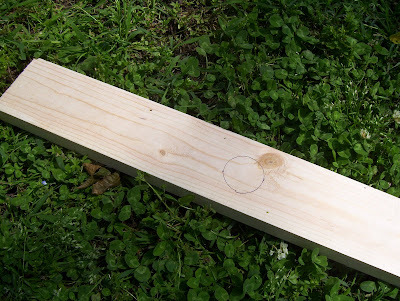 Except the wood, hehe, but to buy that, is the easiest part. Once I've made it I'll show it on my blog (Spring and Summer Garden Projects) and I'll link back to your post here :) Thanks so much for sharing, you made my day! This tutorial is perfect! I just found you from Pinterest and so happy I did. Can't wait to see more posts! I love this idea! I've been wanting to use the ladder rung storage in my basement for blanket storage, but was doubtful that I could find a wide enough to hold some of the bulkier blankets. Now I can make one the exact size that I need! So excited!!! Thanks for this great idea! This newly-made vintage ladder is so impressive! 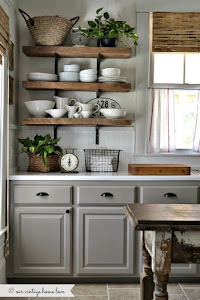 As much as I love vintage things, I never really used a ladder that is genuinely old. For one, safety always comes first. Now, with your idea, I can definitely enjoy the appeal of a vintage ladder while not being worried too much about safety. I just found your blog and simply had to tell you how much I LOVE your style, everything I've seen so far, is so ME!! That includes the ladders! I live in the UK, and like you was looking for a ladder to use for decorative purposes around the house, so can you imagine how thrilled I was when I picked up one for £8 - approximated $12! Not only was this incredibly cheap, but it was an extending one, and was 30 feet long!! When we went to collect it, the guy looked at me as if I were nuts when he saw our car, a Nissan Qashqai, and asked how we planned to get the ladder home, well as it was already in two pieces I'd figured before we went to collect it that if we took a saw with us we could cut each of those in two, giving me FOUR ladders altogether. When I told him I was going to cut it in halves he looked at me, scratched his head, and said 'er, what exactly are you planning on using it for', and when I told him I was going to use one piece in my kitchen to hang pots on, another in my living room to get to the bookshelves, and other bits around the house for 'decorative' purposes, I could tell he thought he had a real 'weirdo' on his hands, but hey, who cares? I'm now the lucky owner of FOUR gorgeous chippy old ladders - YIPPEEE!! 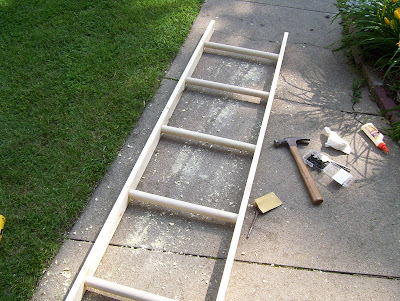 Wow, I did not know you could actually DIY a ladder because I thought it would be so troublesome with so many materials that is going to take so much time. Furthermore, I have no idea that it can actually be used as a towel storage in the bathroom. I guess I am not creative enough to think out of the box and see a ladder only as a ladder alone. Anyway, thanks for sharing this set of comprehensive step by step instructions to build a low cost towel and magazine hanger. Thank you! I've been looking for an old ladder but they are hard to find. Never occurred to me to make one. You just made my day. Thank you so much! I have been looking for an old ladder but they are hard to find. Never occurred to me to make one. You have made my day. Very nice! We built ours yesterday and will finish it next weekend. Where do you get your wood for under $10? We spend over $25.